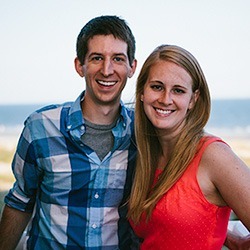 Work From Home Reviews Michael Andrews and Fast Success Camp: $10,000 in Only 30 Days? Rating: 2 Not a scam, but not fully developed either. The Good: This program offers eight step-by-step training videos that are well planned and executed. You receive timely support if you have issues. The Bad: The program is half-baked and needs a lot more content before it can deliver on its promises. The sales page uses the same gimmicks as other scams. At $39, this program is overpriced for what it currently delivers. The Bottom Line: Fast Success Camp is a good product, but it won't teach you all you need to know about product launches and marketing. At this time, we don't recommend it as there are better alternatives out there that let you get started for free. My Cash “On Demand” System- You learn how to generate $5K in just 7 days. How to Achieve ‘Flow’ (Laser Focus)- How to cut down on distractions and achieve your goals. The $20,000 in 24-Hours Product Launch- A step-by-step system for launching your own five-figure product. Million Dollar Product Ideas- How to find and execute million dollar profit ideas. Instant Web Assets & Profit Centers- How to create your first product in under 60 minutes. The “Bulk Traffic” System- How to get warm traffic and direct it to your sites and products. I didn’t click on the nondisclosure box, yet I was still allowed to go forward and make the program purchase. 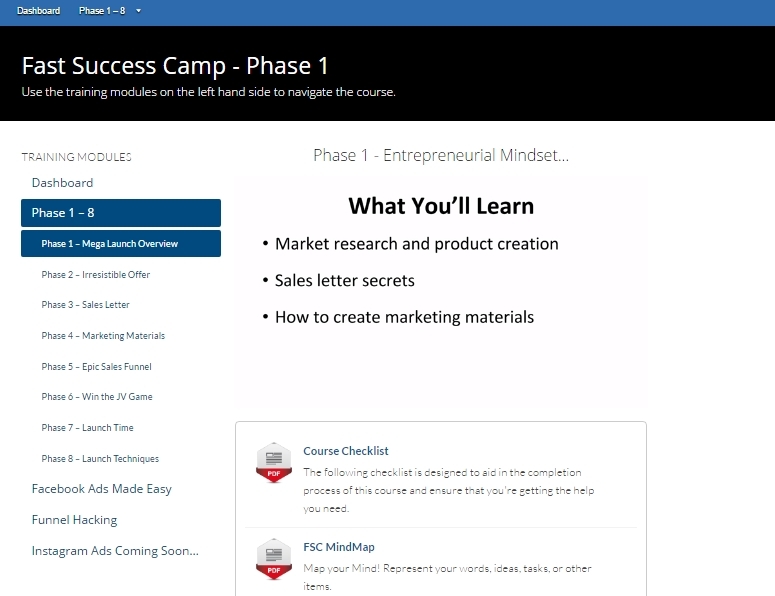 After I clicked the button to start the Fast Success Camp course, I saw the following screen. 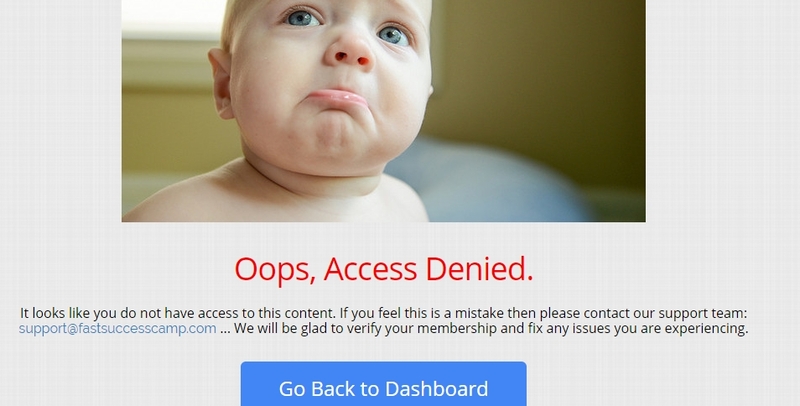 I had already registered my account and created a password for it, so this issue puzzled me. I emailed Support. As you can see from the above screenshot, this program is divided into eight training phase videos. What’s in these videos? Phase 1- Mega Launch Overview (9:44): In this introductory video, you get an overview of how affiliate marketing and product launches work to make you money online. You learn that products are often launched through online marketplaces such as JVZoo, Clickbank, and Warrior+Plus. The differences between different online marketplaces are explained. You also learn about affiliate recruitment. Phase 2- Irresistible Offer Creation Secrets (8:50): Different product niches are introduced, and you learn how to conduct basic research on niche popularity, wants and needs. You receive good advice on product creation and how it can be outsourced. 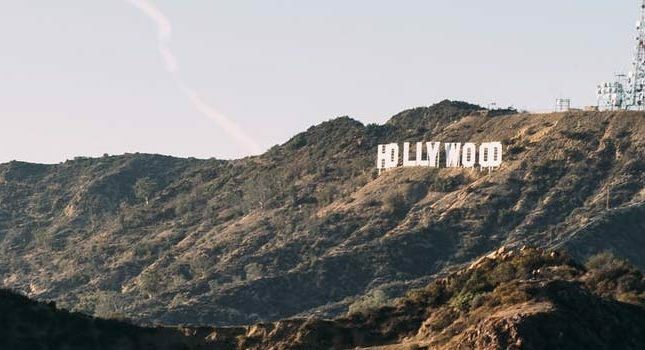 For example, the narrator discusses how you can create a training course based solely on a transcript; this transcript can be turned into a video presentation by hiring a voiceover artist and making summary slides. In this way, you provide both the text transcript and videos of your training course as a bundle offer. PLR (private label rights) products are introduced, and general advice is provided on how to customize your own product from several PLR sources. Phase 3- Sales Letter (9:17): Different types of sales letters are described, such as pure copy sales letters, pure video sales letters (VSLs), and hybrid sales letters. The different elements (e.g., call-to-action or CTA) of a sales letter are described. 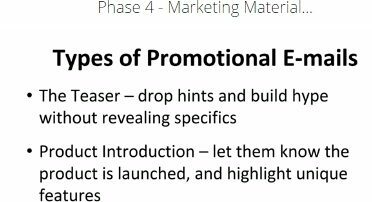 Phase 4- How to Create Marketing materials (8:49): Promotional emails and banner ads are introduced as two essential marketing materials that you need to create and send/display prior to your product launch. 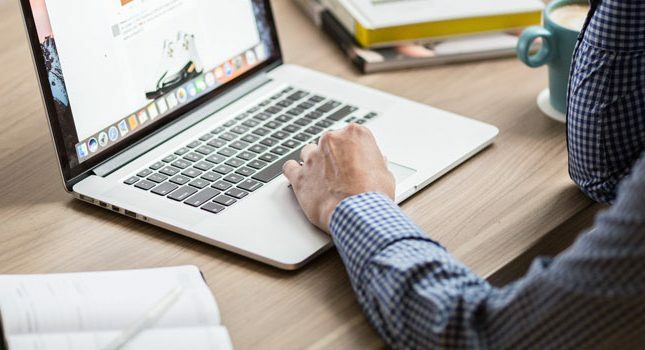 You learn how to get around spam filters (e.g., include a plain-text version of your email), create attention-grabbing subject lines, and design your banner ads. You are advised to offer bonuses with your upsells, and to create discounted products (i.e., downsells) for customers who didn’t initially purchase your normally priced upsells. 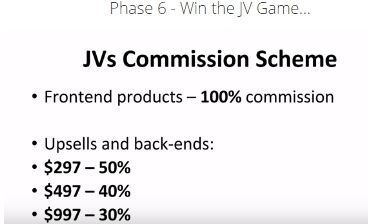 Phase 6-How to Win the JV Game (8:40): Joint venture (JV) partners can help you because they usually have large subscriber lists and can promote your products for free. Commission rates vary and can range from 100% (for the cheap front-end product) to 50% (for an expensive backend product). You can find JV partners at several places, including live events and social media. You can even hire a JV broker. Some tips are provided on how to ‘court’ potential JV partners, such as by offering free access, a lucrative affiliate contest, and high commissions. 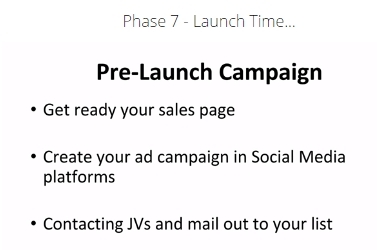 Phase 7- Launch Time (5:24): A step-by-step campaign plan is provided for you on how to promote your product prior to and up to its launch day. 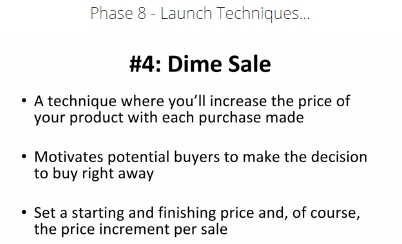 Phase 8- Product Launch Techniques (4:05): Offering bonuses and discounts, creating a countdown timer, and having a dime sale are some of the techniques introduced in this video. All these techniques help create interest in your product and the motivation to buy it now. Facebook Ads Made Easy (3:42)- In this area, you are introduced to 25 total videos that promise to teach you how to generate effective Facebook Ads. This bonus must still be under construction, however, because all I could find was its single introductory video. Funnel Hacking (1:09)- The technique used here involves observing what your competitors are doing and copying (i.e., hacking) their techniques. It appears that additional videos on this technique are coming soon. Instagram Ads (coming soon)- You cannot access this area yet. 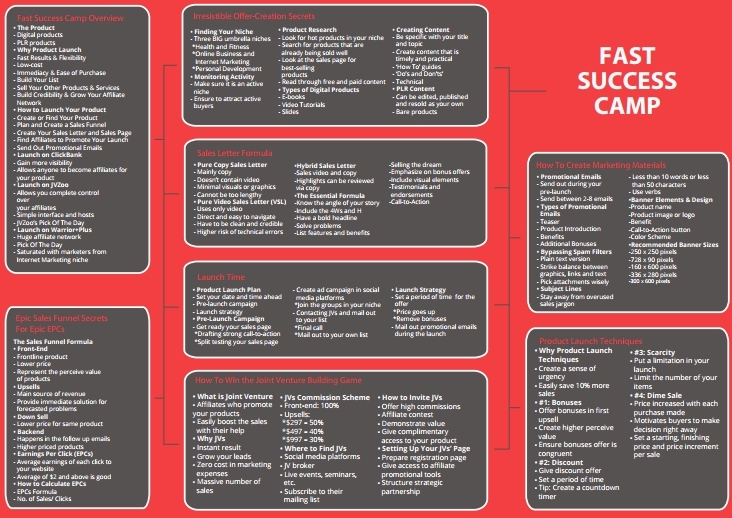 FSC MindMap– This one page PDF sums up everything you were told in the eight phase training course. I found the eight video trainings that FSC provides to be solid and full of good information. Some of the presented information was general and introductory, while other information was novel and quite useful. Therefore, the FSC program is beneficial for both the newbie and experienced marketer. 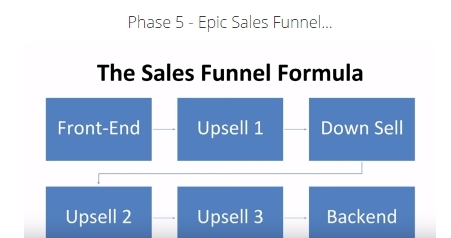 Although this was never announced in the videos, FSC sometimes referred to its own sales funnel techniques when discussing possible selling strategies. For example, I was fairly certain that FSC had hired a voiceover actor to read its training transcripts for those eight videos. I found such ‘in-house’ examples a good way to demonstrate effective sales techniques. Unfortunately, this program is still very ‘raw’ and doesn’t contain much more than its eight training videos, the total of which span only about an hour of time. The FSC sales page promises you access to all kinds of secret sales methods and quality products (e.g., Million Dollar Product Ideas), which I found nowhere in its dashboard area. For its sign-up price of $39, this program is overpriced. Furthermore, its major bonuses are still in development and therefore unavailable. Should this program be fully developed, I would like to see real-life sales copy and emails instead of only theoretical information. I would also like to see content devoted to A/B testing and conversion rate optimization. As of this time, we’re not giving Fast Success Camp a recommendation. It’s incomplete and the price is too much for what is being offered. For a program that teaches you in-depth sales and marketing strategies and has numerous tutorials, videos and coursework, plus let’s you get started for free, check out my #1 recommendation here.